This new animated Spider-Man movie is currently rated the third best super-hero film by Rotten Tomatoes' algorithm. That seems undeservedly high, but it is a fun film worth seeing. All those comic book tropes that looked out of place in Ang Lee's Hulk film, like panels and Comic Sans captions, make much more sense here. This film is also the answer to our recently asked question of "Does Marvel ever do Multiverse stories well?" Instead of Grant Morrison's Superman Dynasty, we get a collection of cross-dimensional Spiders (both men and women) homaging different genres of art while showing that "unique" and "alone" are not the same thing. 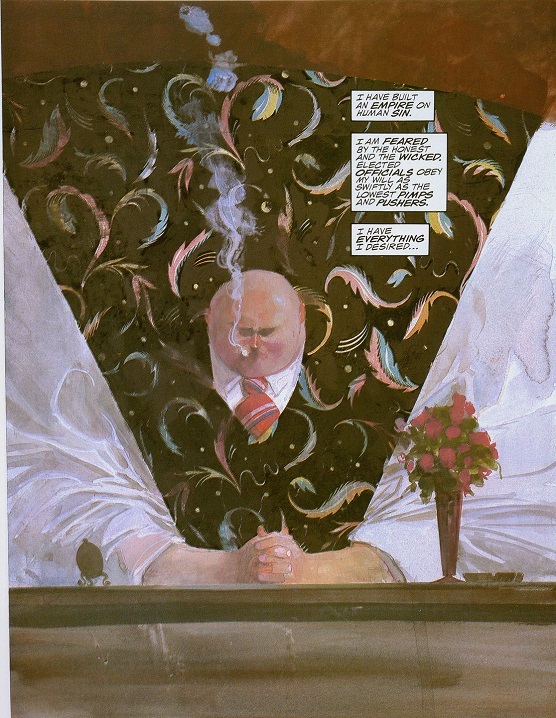 Kingpin is suitably imposing and powerful, even if we're sometimes wondering why Spidey insists on engaging him at melee range all the time. My six year old was able to identify the character of Scorpion just from his appearance (having never seen him before), and several other members of Spidey's rogues gallery make effective showings as well without making the film seem overstuffed. I saw Easter Eggs related to both Bendis and Ditko, and I'm sure more will be obvious on a repeat viewing. My only complaint is that I hope the theater was accidentally showing us the 3D version of the film, because many images had a weird double-vision effect that I couldn't be sure whether it was intended or not, and the frame rate seemed slower than normal too, giving a strobe effect. I don't like the proliferation of Spider-characters in recent years. I feel it makes Spidey less special. From other Spider-characters to his supporting cast, none of them are ordinary now. That said, Into the Spider-Verse does look fun, and I will be seeing it at some point. Finally got around to seeing Spiderverse today. Holy cow! What a fun movie! Good story, excellent voice actors, and tons of Easter eggs and hat-tips to fans of Spidey in various media. Finally saw this on pay-per-view. Fantastic film, good story, great animation, fun characters, terrific humor, strong voice talent and even good music. I'll have to buy this on blu-ray now. We watched it on Blu Ray last night. Still fun. Plus a bonus short. yeah. . I'm not really a Marvel Movie fan (some of them are really good, but i don't rush out to see them, and several of them I still either haven't seen (Black Panther, Captain Marvel, Iron Man III, Thor 2), or saw only on TV (Dr. Strange, Hulk, Iron Man 1/2)). but caught this in the discount theater a few weeks back and LOVED it. very, very well done, and likely will end up owning on Blu. Went to see this last night at "the cheap theater" (second runs, $4 ticket). Enjoyed it very much. In fact, this and Spider-Man Homecoming are probably the superhero movies I've enjoyed the most recently. I've found most of the Marvel movies pretty forgettable (I couln't even tell you the plot of most of them a day later).